My friend Bummy sat down with me to help explain a fun drinking game called “Mexican Dice” Here is a slide show explaining how to play. (I’ve never made one of these before, and I know the slides go pretty fast, so until I figure out to fix it, you should probably manually go through the slides. Mexican Dice is just another fun game to play if you and your friends don’t feel like going out for the night. And remember, don’t forget to comment. CHEERS! Nothing against night clubs, but I’m more of a hole in the wall kind of guy. And by all means, Brathaus is the perfect hole in the wall (in a good way of course). Located on 115 E Court Street, near Cookie Jar and Corner Grill, Brathaus is a great place to just relax and have a few drinks. You could almost call the Brathaus a sports bar, you can tell they love their Falcon Hockey there. A couple of tvs over the bar, and big screen at one end of the building, offers a pretty good environment to watch a game. 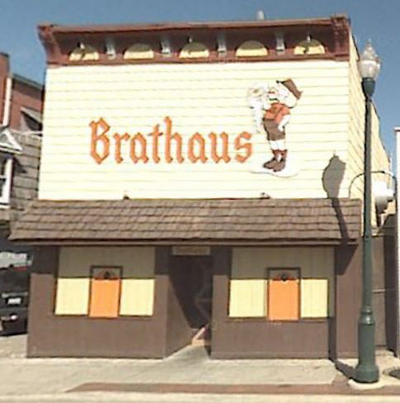 Unlike some other bars in town, Brathaus doesn’t have the wide variety, but that’s not what the place goes for. Each night they have fantastic deals on Natty, Bud light, and Molsen. Their happy hour deals on Fridays are a can’t miss. Almost everything is served in a plastic cup, so it may look cheap, but its all part of the environment. No one wants to clean up broken glass. 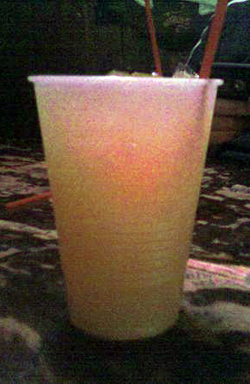 The one drink brathaus is know for is the “Legal Joint.” The mixed drink contains 1oz amaretto, 1 oz rum, 1 oz vodka and the rest of the cup is topped off with orange juice. The legal joint is a perfect blend of sweetness and sting. For three bucks you get you get a great mixed drink that no place in town sells. For all the bars I visit, I like to rate them on 5 areas; selection of beer/drink, price of drinks, atmosphere (music, crowd size, etc), cover charge, and things to do (Pool, Darts, Karaoke, etc). All of these areas will be ranked on a scale of 1 to 10, one being bad, ten being good. Remember, don’t forget to comment, and Cheers! For anyone of you who know me, or will soon get to know me, you know that I love beer. Not in the way Homer Simpson loves beer, but it the way that lets a poor college kid like me travel the world through tasting beer. I did a fair amount of traveling growing up thanks to my Nana and Grandpa, and I’ve been to Europe twice when I was in high school. But now that I’m getting ready to graduate college, I need to find a real job and I wont be able to have the time to travel as much as I always wanted to. So i use beer to travel now. There’s a lot you can learn about a country by the beer they have. What kind of ingredients are available to the people, does the country have a vast history of beer, do other countries influence other countries beers? There are so many questions to be answered. So I allow the tasting to tell the story. 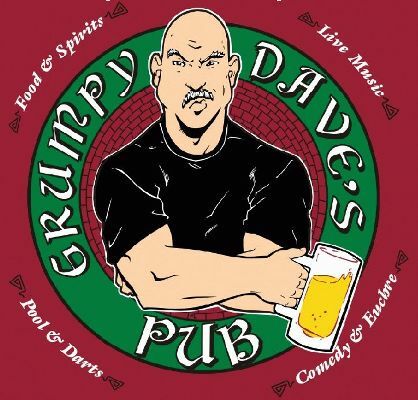 And there is no better place in town to do that than at Grumpy Dave’s Pub. Located just above Easy Street Cafe, near the corner of Main St and Wooster, Grumpy Dave’s Pub has a huge variety of bottled beers. With well over 105 different beers from over 19 countries and the United States, Grumpy Dave’s has a ton of taste for a pretty good price. Some of my favorite beers I’ve tried here are Samuel Smith Nut Brown Ale, Murphys Irish Stout, and Harp. Now I’m not saying i would never have tried these beers, but Grumpy Dave’s was a convenient place to try them all. For all the bars I visit, I like to rate them on 5 areas; selection of beer, price of beer, atmosphere (music, crowd size, etc), cover charge, and things to do (Pool, Darts, Karaoke, etc). All of these areas will be ranked on a scale of 1 to 10, one being bad, ten being good. Here’s a video interview I did with Grumpy Dave himself last December, and remember don’t forget to comment! Cheers! Grumpy Daves Pub from Brendan Packert on Vimeo. So I’m pretty sure every broke college student at one point in time has been in a beer cave. 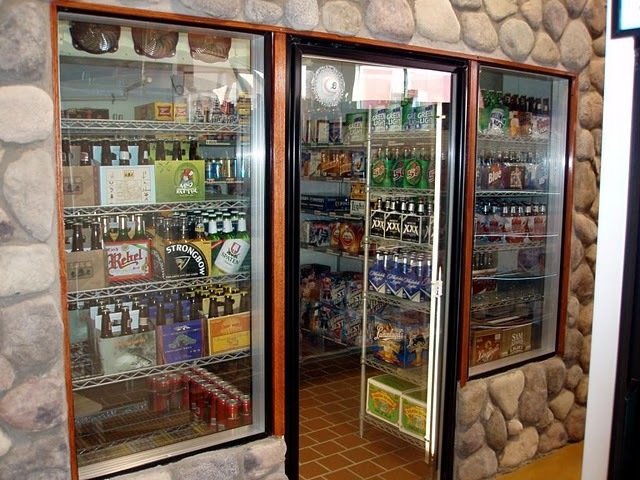 These “caves” are in nearly every store that sells beer in Bowling Green, Ohio. Whether its a gas station, grocery store, or the many carry-outs around town, beer drinkers alike always want to get the most for their money. Some people know exactly what they want to get when they walk in these caves, but sometimes people can spend minutes looking at the selection trying to figure out whats the best deal. Because I never settle for the same beer twice, I went out to 10 stores that sell beer in BG and did a little investigating to see who sells the cheapest beer. Now these prices are not sale prices, they’re their normal retail prices for Bud Light, Busch Light, and Miller Lite. I chose these three beers because i know they are fairly popular in town and that every store usually carries these three brands. Its also the journalist in me that feels like revealing the truth, and I hope you haven’t been over-paying for beer all these times. – Walgreen Drug Store 1013 N Main St (across from Al-Mar Bowling Alley). As you can tell, There can be a lot of places that competitively sell their beer. And like I said earlier, these are their regularly priced beer. I’m not here to post business’s sales or promotions. But always keep a look out for a good sale, because that’s where the real savings are. Never settle for going to the same business, because a lot of the time, there will be another store with the same or cheaper price on your favorite beer. Leave your comments on my findings and let me know what you think. Cheers BG.